Note: If you need to find the percentage of a total or find the percentage of change between two numbers, you can learn more in the article Calculate percentages. Let's say you need to decrease—or want to increase—your weekly food expenditures by 25%. To calculate the amount, use a formula to subtract or add a percentage. In this formula, 1 is equivalent to 100%. The values inside the parentheses calculate first, so ther value of C2 is subtracted from 1, to give us 75%. The result is multiplied by B2 to get a result of 56.25 for Week 1. 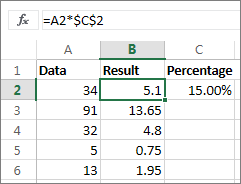 To copy the formula in cell D2 down the column, double-click the small square green box in the lower-right corner of cell D2. You get the results in all of the other cells without retyping or copying-and-pasting the formula. Then double-click the fill-down handle again. Consider an example table like the one in the figure, in which we've got a few numbers to multiply by 15 percent. Even if the column has 100 or 1,000 cells of data, Excel can still handle it in a few steps. Enter the numbers you want to multiply by 15% into a column. In an empty cell, enter the percentage of 15% (or 0.15), and then copy that number by pressing Ctrl-C. Select the range of cells A1:A5 (by dragging down the column). Right-click over the cell selection, and then click Paste Special (do not click the arrow next to Paste Special). Click Values > Multiply, then click OK. The result is that all the numbers are multiplied by 15%. Tip: You can also multiply the column to subtract a percentage. To subtract 15%, add a negative sign in front of the percentage, and subtract the percentage from 1, using the formula =1-n%, in which n is the percentage. To subtract 15%, use =1-15% as the formula. The $ symbol makes the reference to C2 absolute, which means that when you copy the formula to another cell, the reference will always be to cell C2. If you didn't use $ symbols in the formula and you dragged the formula down to cell B3, Excel Online would change the formula to =A3*C3, which wouldn't work, because there is no value in C3. Tip: You can also multiply the column to subtract a percentage. To subtract 15%, add a negative sign in front of the percentage, and subtract the percentage from 1, using the formula =1-n%, where n is the percentage. So to subtract 15% use =1-15% as the formula.